The National Alpine Cliff and Cave Rescue Corps (CNSAS) is an operational division of the Italian Alpine Club (CAI), with its own declaration, constitution and general rules, approved by the general assembly, the CAI’s highest governing body. The organization is based on Regional Services, coordinated on a national level, to which the different national schools also report. Each Regional Service is composed of so-called Delegations (covering alpine rescue) and Zones (for cave rescue), which in turn are divided into Stations (either alpine or caving). The more than 7000 members of the CNSAS are all expert climbers or cavers of proven experience and capabilities, with a basic knowledge of medical rescue. Their specialized and frequent training are the best proof of their high professionalism, which is put to use during rescue in harsh, inaccessible or hostile environments. The CNSAS operates in all accidents which may occur while hiking or mountaineering (on trails, walls, ice climbing, crevasses, etc. ); caving; cave diving (water filled caves, mountain lakes); canyoning (canyon and gorge); natural events (avalanche, flooding, earthquake etc. ); failure of cable transportation (chairlift, gondola) and also for medical emergencies in any location difficult to reach with a standard medical team. What does the CNSAS do? 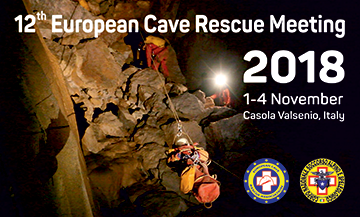 The National Alpine and Cave Rescue Corps carries out for more than fifty years the public service of rescue in mountain and caving settings, and in any inaccessible area of the Country. The CNSAS, thanks to volunteers who operate nationwide, rescues people in distress, recovers bodies and provides medical aid in mountain and caving environments to persons injured, in danger or missing. The CNSAS teaches prevention and vigilance over accidents that may happen while practicing outdoor activities in mountain and cave environments: climbing, alpine and cross country skiing, hiking, all sports usually associated with a mountain setting, caving, cave diving, canyoning and cultural events related to the mountain environment. The CNSAS, with its technical and organizational capabilities, cooperates with other agencies within the national Civil Protection, in the event of disasters requiring rescue efforts. The CNSAS is constantly engaged in training and refresher courses for its technicians. This guarantees all volunteers a very high standard of preparation so that in the event of a rescue they can operate with competence and professionalism even in the harshest environmental situations. Founded in 1954, the CNSAS is a free association made up of some 7000 members, volunteer technicians and medical staff, organized in Delegations, Zones and Stations spread all over Italy. The CNSAS is an operational division within the Italian Alpine Club: it has ample autonomy, both organizational and functional. Its duties are vigilance, prevention and rescue within activities related to climbing, mountaineering, hiking and caving. CNSAS works in close cooperation with the Italian National Health Service and all other government agencies dealing with search and rescue and emergencies, taking the lead when a complex rescue operation occurs. The regional and provincial operational branches of the CNSAS are the sole, officially recognized partners of the Italian National Health Service for medical rescue in mountain and caving environments. The CNSAS can and does work in various extreme natural environments, from typical mountain settings at all elevations, to canyons and gorges (canyoning), complex and extended cave systems, sumps, springs and underwater caves and deep water. In order to warrant the fastest possible rescue and medical assistance, especially in mountain and remote locations, the CNSAS cooperates with recognized flying rescue organizations nationwide, providing them with technical and medical crews certified for flight rescue.